15 years ago, the CentOS project started up in order to fill a gap left by a change in the way that Red Hat decided to market their product. Many of the people that were involved in those early days are still involved today, although in different capacities than they were then. Over they years, their involvement has changed, due to their own changing job responsibilities, as well as the shifting technological landscape. Over the next few months, as part of our celebration of our 15 year anniversary, I'm going to be talking with some of these people that were involved in the early days, as well as some that have joined later on, to talk about how and why people get involved in this project. If you would like to tell your story, please get in touch with me at rbowen@centosproject.org and we'll schedule an interview. Packaging and maintaining different FOSS based virtualization applications that one can install and run natively on CentOS. Tomasz Baranski and Yuval Turgeman joined the SIG for oVirt project. oVirt 4.2 reached end of life with the upstream release of oVirt 4.3. Upstream is planning 4.3.1 to be shipped live on February 26th, the SIG will rebase on that. The Virtualization SIG remains fairly healthy. All the projects within the SIG are updating regularly on biweekly meetings. oVirt had a conference in Milan on November 16th 2018 and is planning a new conference in Rome this spring. oVirt was also present at Devconf.cz and Fosdem. Xen 4.10.2 is also available, and the dom0-enabled Linux kernel is at 4.9.127. Release candidate builds of Xen 4.12 are also available. We've updated centos-release-xen to default to Xen 4.8 in the CBS repos. In this post, we're going to talk about how to use buildah to build container images on CentOS. buildah is a command line tool that facilitates building OCI compliant images. There's a plethora of information available around what buildah is on its GitHub landing page so we won't dive more into what it is. However, it's worth mentioning that buildah helps you build container images without having to run any daemon in the background, unlike the docker CLI tool which requires the Docker daemon to be running in the background. buildah offers a number of features and options. To know about these, simply execute buildah on the command line or refer to its manual page (man buildah). $ buildah bud -t wget . podman is a tool for managing pods, containers, and container images. Its website contains extensive detail about its capabilities and uses. In this blog, we saw simple steps that need to be performed to install and use buildah to build OCI images which can then be pushed to local Docker daemon's storage. buildah can also push container images to the remote registry. It is highly recommended to read the documentation to know about more features and capabilities of buildah. In a future blog, we will share how the CentOS Container Pipeline team managed to build container images on OpenShift using buildah. Just a quick update - the schedule from the recent CentOS Dojo at FOSDEM has been updated to include the videos from each presentation. Note: Three of the talks are missing video due to equipment failure. Another month into 2019, and we have a lot to tell you about. SIGs - Special Interest Groups - are where people work on the stuff that runs on top of CentOS. We started off February with a bang, with our annual CentOS Dojo at FOSDEM. You can read a summary of that event on the CentOS blog. We will be posting video from the event on the CentOS YouTube channel as soon as possible. We also had a table at FOSDEM itself. FOSDEM is a gathering of 6000 free/open source software enthusiasts at Brussel's ULB. Topics covered are everything from distributions to licensing to community to storage. Video from almost every session at the event is already available at the event website. Next month, we expect to have a presence at FOSSAsia in Singapore. And in April we are planning to hold a Dojo at Oak Ridge National Labs, in Oak Ridge Tennessee. If you would like to host a Dojo, or have a suggestion for where we should have one, please get in touch with the CentOS Promo mailing list. Other upcoming events are always listed on the events wiki page. On Friday of last week, we once again gathered in Brussels for our annual CentOS Dojo at FOSDEM. 14 speakers gave talks on a wide variety of topics, ranging from deeply technical, to community-centered, to a vision of what's coming in CentOS 8. The full schedule is on the event website, and the videos from the event will be posted on YouTube as soon as we can possibly get them up. We had roughly 90 people in attendance at this event, which was about the same as last year. 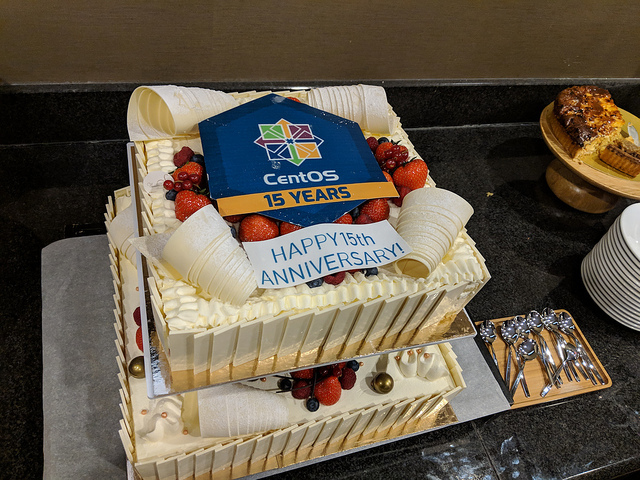 At lunch time, we celebrated CentOS's 15th birthday with a lovely birthday cake. If you missed us in Brussels, don't worry. We have lots of other events coming up. If you would like to host a Dojo, or have a suggestion of where we should run on, please don't hesitate to get in touch with us on the CentOS-Promo mailing list. We are pleased to announce new official Vagrant images of CentOS Linux 6.10 and CentOS Linux 7.6.1810 for x86_64. All included packages have been updated to January 28th, 2019. The CentOS NFV SIG exists to support Network Function Virtualization (NFV) in CentOS. Specifically, the idea is to be a vehicle to provide packages for implementers of software networks on the CentOS platform. In this reporting period, we have had little formal participation. However, there has been continued in NFV on CentOS and interest in deploying our packages on CentOS. We are always looking for additional community participation in all aspects of this SIG, including promoting, building releasing other packages for NFV. Anyone interested in participating in the NFV SIG should subscribe to the generic CentOS mailing list. The past quarter has been a slow one in terms of actual delivered packages. Our main active package, VPP has not been released since 1807. Upstream version 1810 requires dev-toolset 7. However, recently dev-toolset-7 and all prerequisites have been built and-or cross tagged into the NFV SIG common. We are currently in the process of building vpp 19.01 for release and plan to have these packages ready in February. The health of NFV SIG could be better. It was originally perceived as the sponsor for getting OPNFV project into the CentOS distribution. However, subsequently OPNFV releases its own CD images. Subsequently it was primarily sponsoring building opendaylight packages which are still built as part of the upstream product CI. At this point, the project is looking for a renewed focus. Perhaps, packages to facilitate containerization and kubernetes. Other ideas and sponsors are welcome. Also, we have also been working towards several upcoming events. On February 1st, we will have a presentation about NFV SIG at CentOS Dojo at FOSDEM, in Brussels. The CentOS Promotion SIG exists to provide promotion, and consistent messaging, of CentOS, both at physical events and online. In the reporting period, we have had participation from a handful of people. We are always looking for additional community participation in all aspects of this SIG, including, but not limited to, helping out at events. Anyone interested in participating in the Promo SIG should subscribe to the mailing list. The past quarter has been a slow one in terms of actual event participation. We had a presence at the Supercomputing event SC18 in Dallas, Texas, where Rich Bowen interviewed some of the student cluster competition teams. Those videos may be seen on the CentOS YouTube channel. We have also been working towards several upcoming events. On February 1st, we will be holding the annual CentOS Dojo at FOSDEM, in Brussels. At the time of this writing, we have 125 people registered for the event. A followup event report will be posted here in the next 2 weeks. In April, we are planning to hold a Dojo at ORNL, in Oak Ridge, Tennessee, USA. The schedule is coming together and we should be announcing more details immediately after FOSDEM. Later in 2019, we plan to hold dojos at DevConf.US, and DevConf.IN. No details are available for either of these events, but should be announced in the next month. Each month we publish the community newsletter. These may be read on this blog, and are listed in the wiki. We are planning various things around the upcoming 15th anniversary of the CentOS project, including birthday cakes at various of our Dojos, and a series of interviews with people who have been around the project for many years. We hope to record some of these interviews at FOSDEM, and others both online, and at upcoming events during the year. If you would like to be interviewed, please contact Rich on the promo mailing list. This has been a slow quarter for social media, as November and December often are. However, we continue to post content to Twitter, Facebook, LinkedIn, and Reddit. With the announced retirement of Google+, we have discontinued posting content there.